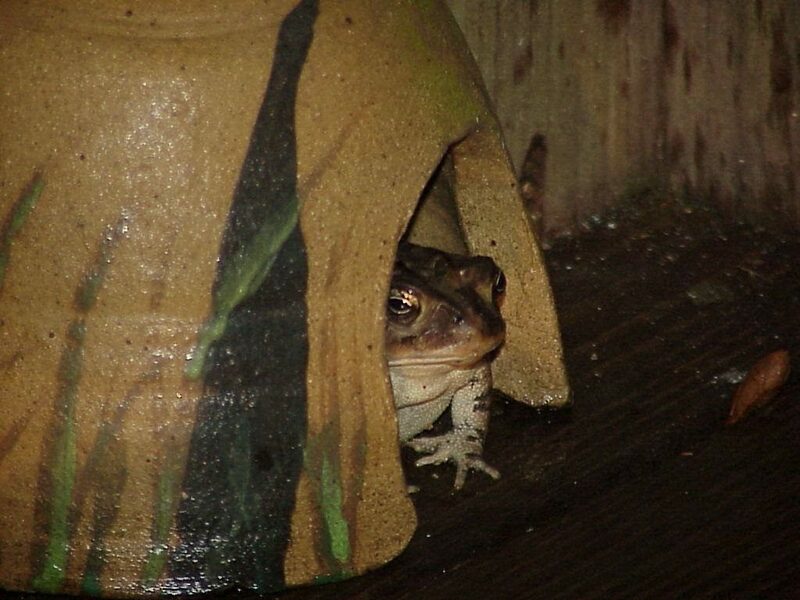 Reptiles and amphibians use plant material for shelter from the weather, as cover while foraging for food, and as a platform for territorial and courtship displays. A number of plants and other materials can be added to your landscape in order to provide these necessary elements. Natives are available for dry or wet site locations, and full sun to part shade. Frogs usually forage in the evening, but during the day they need to keep their skin moist and cool. Squirrel tree frogs are commonly seen near lights in the evenings searching for insects. Some native plants that are found growing naturally in wet or moist areas can provide daytime resting sites for frogs in the home landscape. Plants such as string lilies (Crinum americanum), southern blue flag (Iris virginica), and canna lilies (Canna flaccida), have long broad leaves that hold and retain moisture which makes perfect shelter for frogs that are looking for wet or moist foliage to wait out the heat of the day. 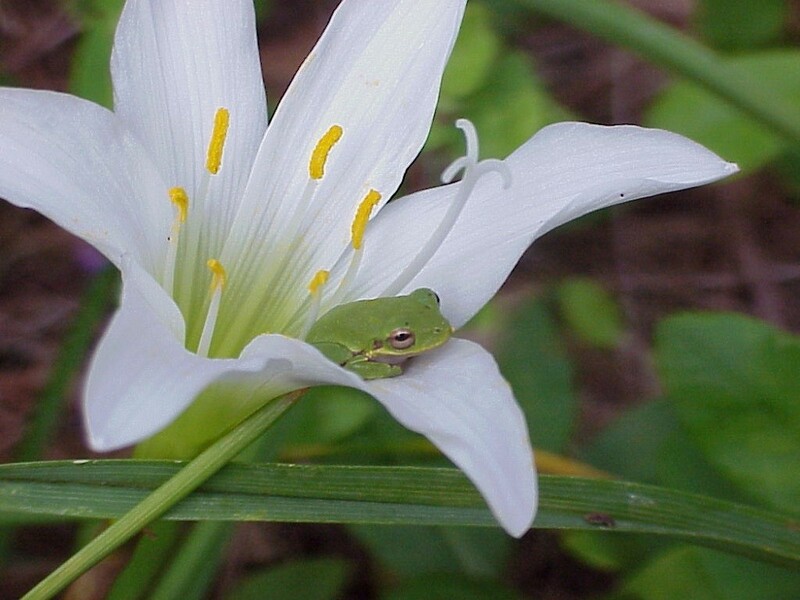 Many frogs also use large flowers for daytime shelter such as zephyr lily (Zephyranthes atamasco) and azaleas (Rhododendron spp). Toads are generally found in drier areas than frogs, however, they do breed in temporary ponds and other small bodies of water. Toads, like frogs, can also be found near lights in the evenings searching for insects. Toads burrow into the cool soil underneath leaf litter during the day and then emerge at night to forage for insects. Leaf litter, loose soil, hollow logs, and low growing vegetation provide an excellent habitat for toads in the landscape. Bunch grasses such as Eastern gamagrass (Tripsacum dactyloides) can provide areas of shelter for toads. Fresh water turtles are aquatic and only venture out onto dry land occasionally, whereas land turtles only use water for drinking or soaking themselves. 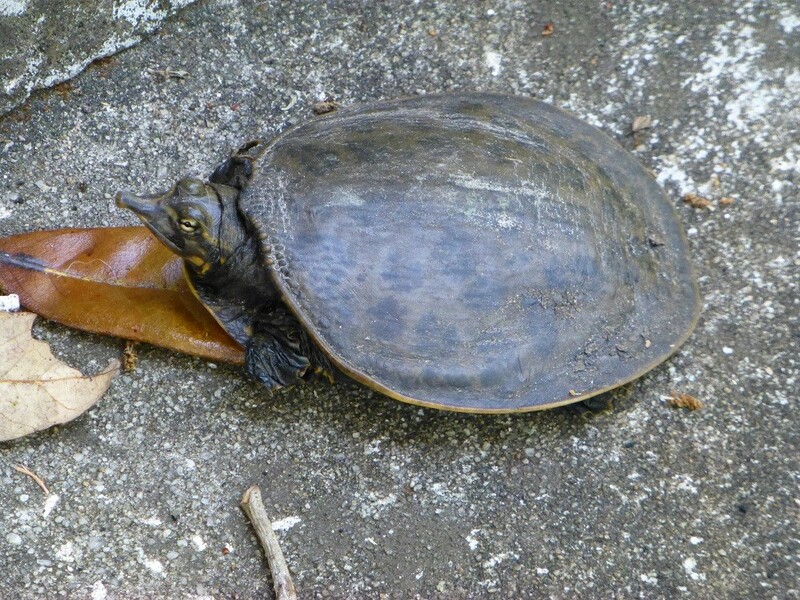 Land turtles found in our area are the Florida box turtle and gulf coast box turtle. Box turtles feed on vegetation (berries, mosses & grass), fungi, and insects, and rest in shallow burrows in leaf litter. Foraging and resting areas can be provided in your landscape by having abundant leaf litter, low growing vegetation and decaying wood for fungi growth. 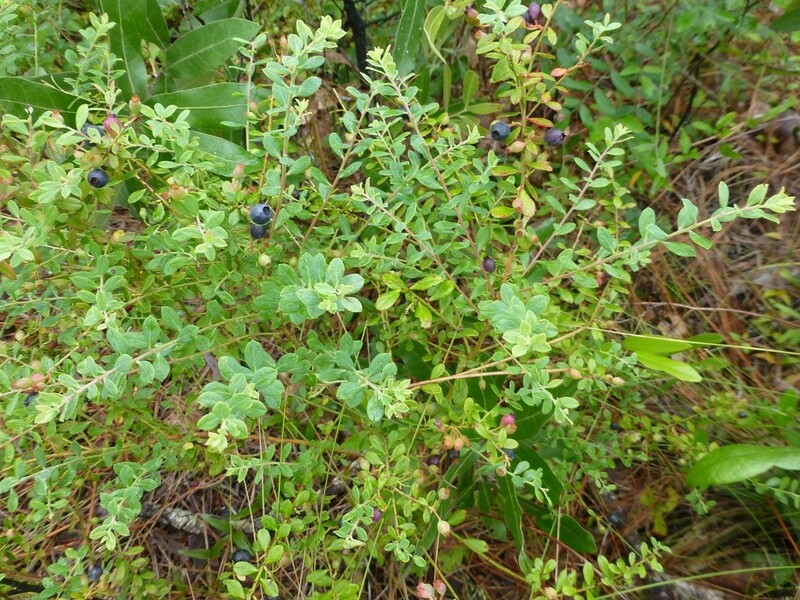 Low growing plants that provide berries in the landscape are shiny blueberry (Vaccinium myrsinites), partridge berry (Mitchella repens), and wild coffee (Psychotria nervosa). Gopher tortoise burrows can be found in shady or sunny areas however, females require sunny, dry, sandy areas in which to dig their burrows to lay their eggs. Gopher tortoises eat low growing vegetation, grasses and berries much the same as turtles. They also eat the same berries as fresh water turtles however they seem to actually prefer bahia grass. Read more about gopher tortoises here. Lizards and skinks like to forage around plants that attract small pollinators such as bees or wasps. They are also very fond of ants. Wooden fences, driftwood, logs, and rocks, provide perches where lizards and skinks can warm themselves in the sun, forage for insects, defend their territories and attract mates. Trees that provide shelter and foraging areas for lizards and skinks are summer haw (Crataegus flava), Carolina holly (Ilex ambigua), and fringe tree (Chionanthus virginicus). Shrubs that provide shelter and foraging areas are buttonbush (Cephalanthus occidentalis), saw palmetto (Serenoa repens), and wild coffee (Psychotria nervosa). 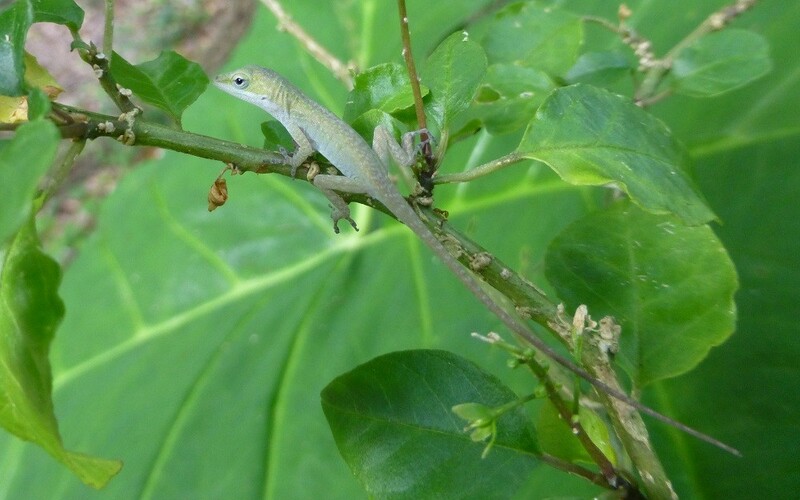 Read more about green anoles here. 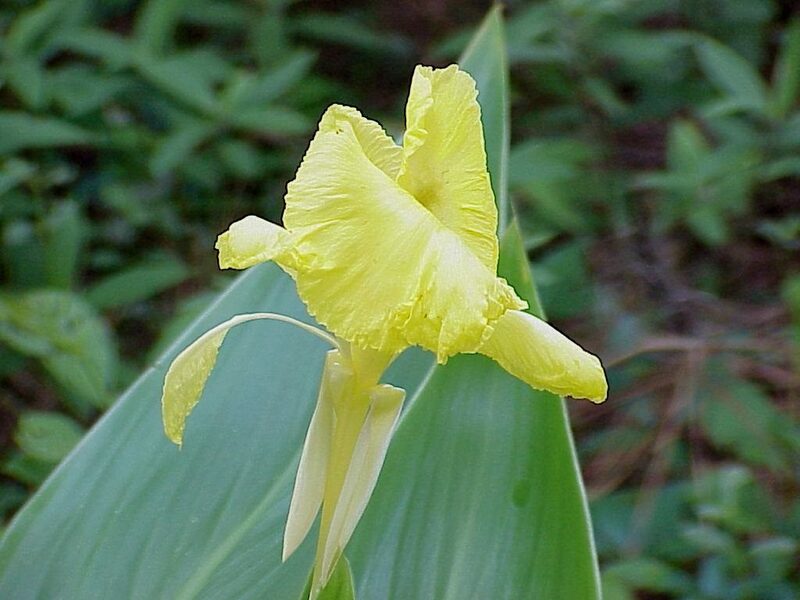 Alligator lily (Canna flaccida) is a perennial flower reaching 4 feet in height at maturity. The flowers are yellow. It grows in full sun to part shade in moist to wet soils. Buttonbush (Cephalanthus occidentalis) is a deciduous shrub reaching 10 feet in height. The white, round, flowers appear in the spring, summer & fall. Also a nectar source for butterflies. It grows in full sun with moist to wet soil. 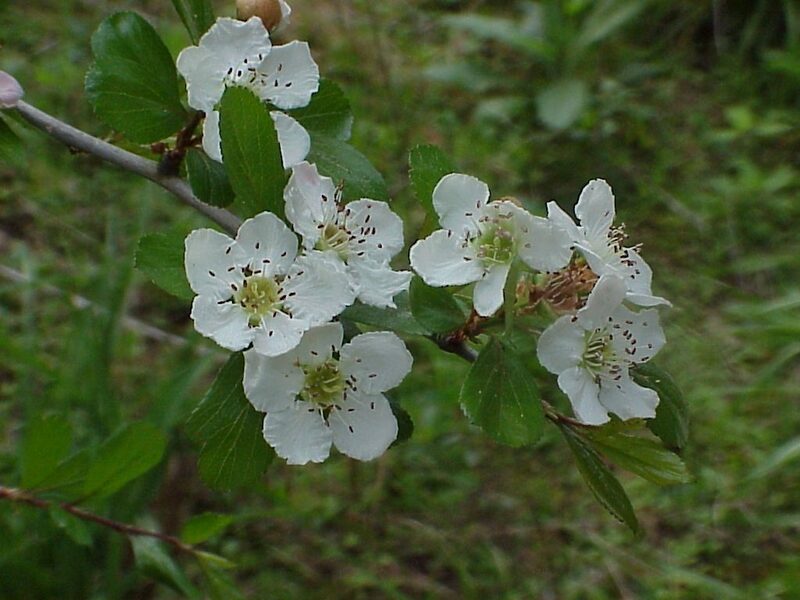 Summer haw (Crataegus flava) is a deciduous tree reaching 15 feet in height at maturity. The white flowers appear in late spring. It grows in full sun with average moisture. 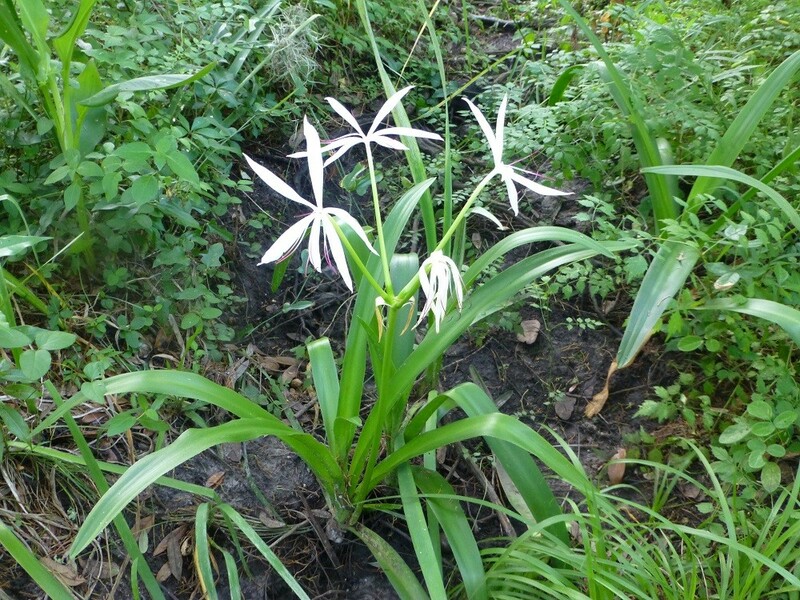 String lily (Crinum americanum) is a wildflower reaching 32 inches in height at maturity. The white flowers appear in the spring, summer & fall. It grows in full sun to part shade with moist to wet soil. 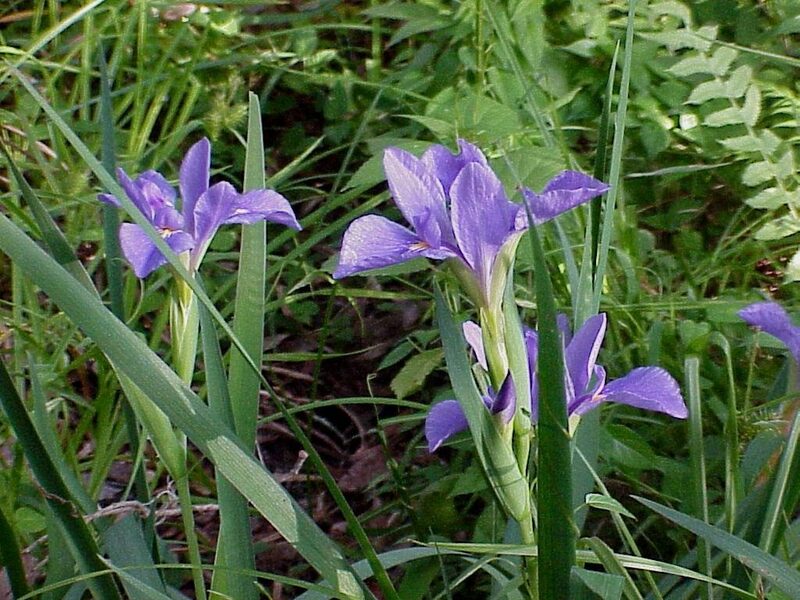 Southern blue flag iris (Iris virginica) is a perennial flower reaching 3 feet in height at maturity. The flowers are blue/purple. It grows in full sun to part shade in moist to wet soils. 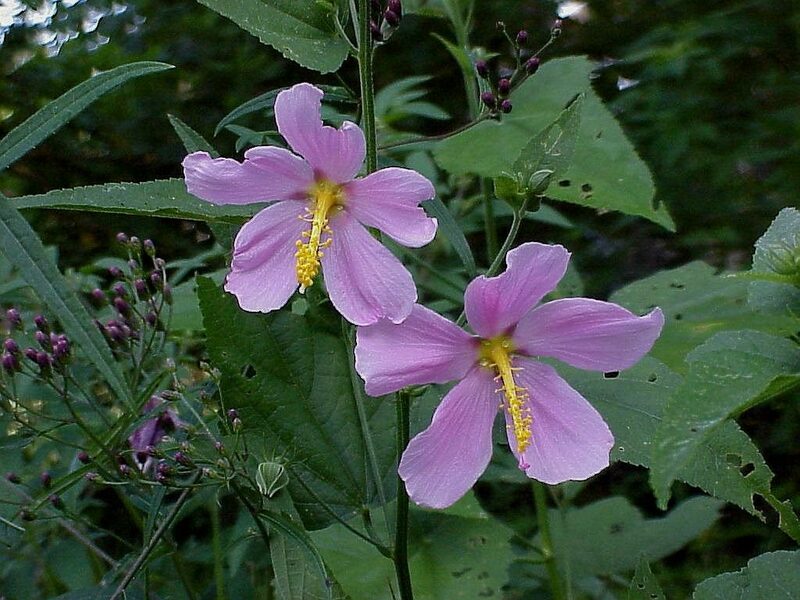 Virginia saltmarsh mallow (Kosteletzkya pentacarpos) is a perennial shrub that reaches a height of 3-5 feet. It grows in full sun with moist to wet soil. 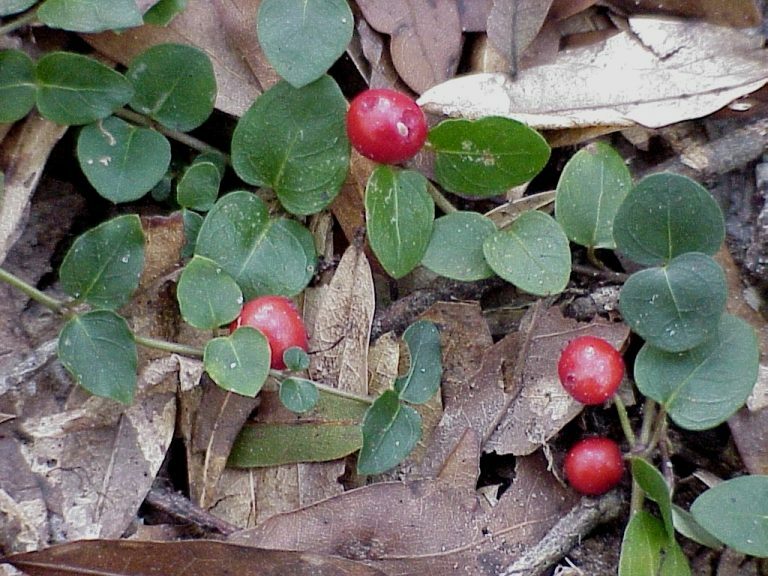 Partridge berry (Mitchella repens) is a native ground cover found in dry to moist woodlands. It rarely gets taller than a few inches and transplants well. 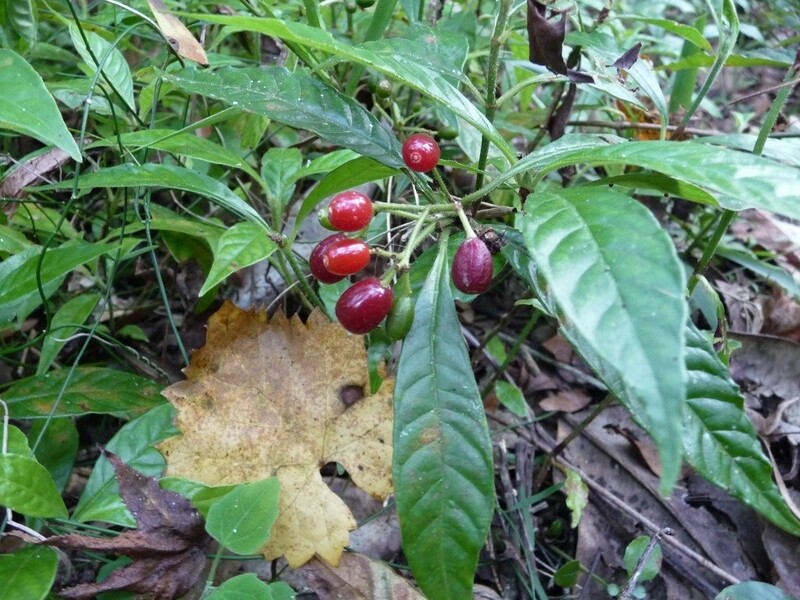 Wild coffee (Psychotria nervosa) is a small deciduous shrub that can reach a height of 2 feet in height at maturity, but generally stays around 1 foot tall. Small white flowers appear all year. It grows in part shade with average moisture. 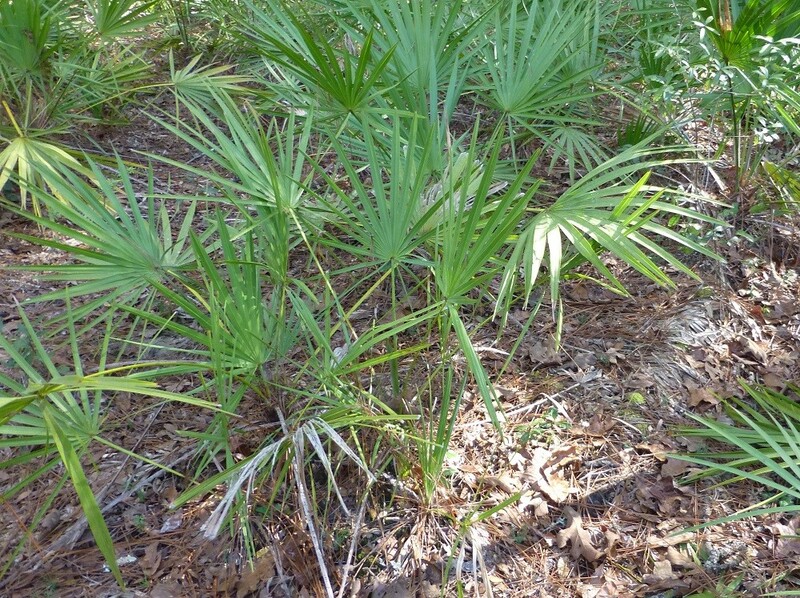 Saw palmetto (Serenoa repens) is an evergreen shrub reaching 10 feet in height. It grows in part shade to full sun with dry to average soils. The flowers provide nectar for many insects. Shiny blueberry (Vaccinium myrsinites) is a low growing native blueberry that rarely reaches more than three feet in height. It grows in the part shade of woodlands and sandhills.